Blouses There are 34 products. Blouse medieval model Ely beige cotton 100%. 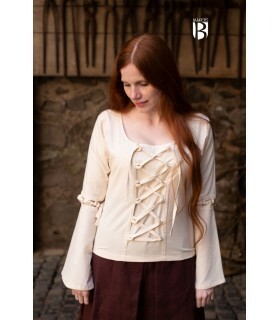 Blouse, medieval for women available in brown and in beige. The bodice is adjusted by means of ties. It is made of 100% cotton and should be machine washable to 30°. White woman's medieval blouse in viscose with laces in front and open sleeves. 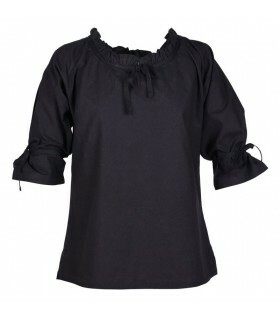 Recommended to wash at 30º C.
Black medieval short sleeve blouse with straps and laces. Machine wash 30ºC. 87% cotton. li>13% linen. Medieval green long-sleeved blouse with laces and shoulders in the air. 100% cotton. Machine wash 30ºC. Blouse medieval women's available in red and orange. It is a blouse, short sleeve made of cotton and can be washed at 30°. Has close strings, both on the part of the neck, as in the arms. Blouse medieval women's available in blue and green. It is a blouse, short sleeve made of cotton and can be washed at 30°. Has close strings, both on the part of the neck, as in the arms. 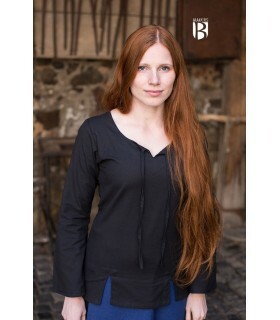 Blouse medieval women's available in black, dark brown and white, raw. It is a blouse, short sleeve made of cotton and can be washed at 30°. Has close strings, both on the part of the neck, as in the arms. 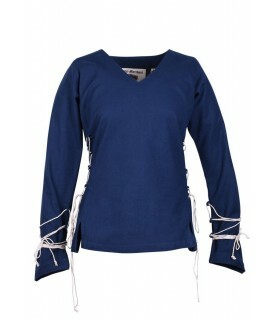 Blouse medieval short sleeve available in blue, white and black. It is made of cotton 100% and can be washed at 30°. Blouse medieval long sleeve available in red and orange. The bodice has lace-up closure at the neck and elastic bands at the wrists. Made of cotton 100% and it should be washed at 30°. 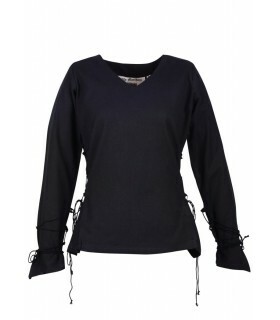 Blouse medieval long sleeve available in black and blue. The bodice has lace-up closure at the neck and elastic bands at the wrists. Made of cotton 100% and it should be washed at 30°. 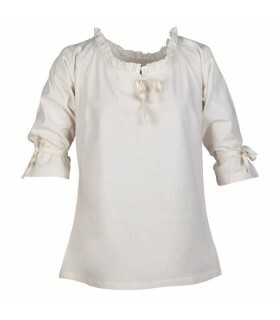 Blouse medieval cream with long sleeves. The bodice has lace-up closure at the neck and elastic bands at the wrists. Made of cotton 100% and it should be washed at 30°. Blouse medieval model Lysia of black color in cotton 100%. Blouse medieval model Lysia color natural white cotton 100%. 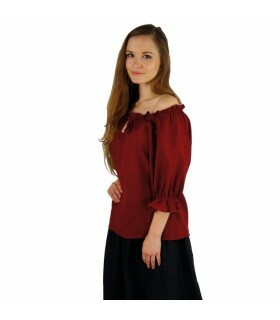 Blouse medieval to muejer model Birga available in red color. It is made in lightweight cotton, which makes it very comfortable. Must be washed in the washing machine at 40 ° with the delicate clothes. Blouse medieval to muejer model Birga available in black color. It is made in lightweight cotton, which makes it very comfortable. Must be washed in the washing machine at 40 ° with the delicate clothes. 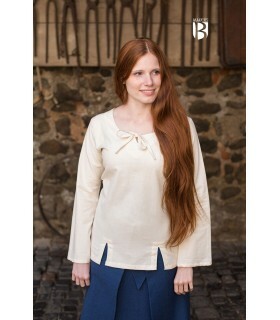 Blouse medieval to muejer model Birga available in white color. It is made in lightweight cotton, which makes it very comfortable. Must be washed in the washing machine at 40 ° with the delicate clothes. 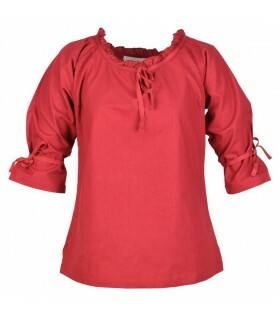 Blouse, medieval for women available in red color and in black. The bodice is adjusted by means of ties. It is made of 100% cotton and should be machine washable to 30°. Blouse medieval white woman. The bodice is adjusted by means of ties. It is made of 100% cotton and should be machine washable to 30°. 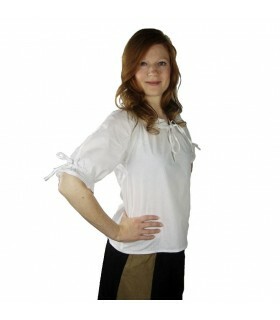 Blouse medieval short sleeve for women. The bodice is fit for the front using ties. Available in beige color. It is made of 100% cotton and should be washed at 30°. Blouse medieval short sleeve for women. The bodice is fit for the front using ties. Available in purple color. It is made of 100% cotton and should be washed at 30°. 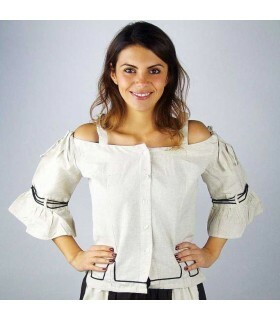 Blouse medieval short sleeve for women. The bodice is fit for the front using ties. Available in red color. It is made of 100% cotton and should be washed at 30°. 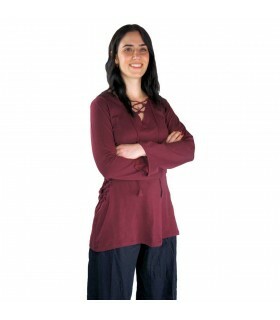 Blouse medieval short sleeve for women. The bodice is fit for the front using ties. Available in black color. It is made of 100% cotton and should be washed at 30°. 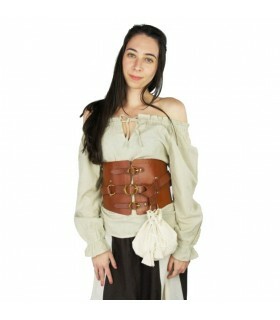 Blouse medieval short sleeve for women. The bodice is fit for the front using white. Available in black color. It is made of 100% cotton and should be washed at 30°. 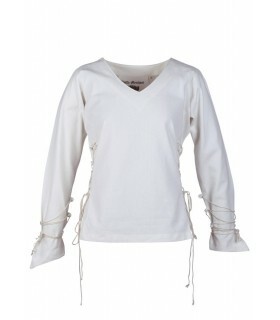 Blouse medieval model Aila in color natural white. The blouse is made of cotton and is adjusted by means of laces on the forearms and at the waist. Although the blouses are of the Renaissance period, this model can be combined with a skirt to get a beautiful medieval look. Blouse medieval model Aila in black color. The blouse is made of cotton and is adjusted by means of laces on the forearms and at the waist. Although the blouses are of the Renaissance period, this model can be combined with a skirt to get a beautiful medieval look. It should be washed at 40 ° C, gentle cycle and no to put into the dryer.